Are you an avid mystery reader? Do you enjoy reading current autobiographies or memoirs? Or are you interested in browsing the latest books purchased by Preus Library? If so, stop by and browse through our Leisure Reading and New Book areas located on the main floor of Preus Library. 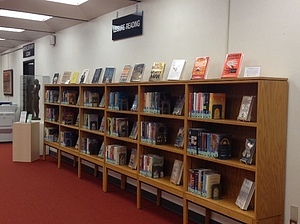 The Leisure Reading collection includes current and recent bestsellers, both popular fiction and non-fiction. You can find mystery, suspense, and detective novels in this area, along with fully illustrated cartoon books, adventure novels, autobiographies, and memoirs. Some of the authors that have been featured in this collection include Stephen King, John Grisham, Chimamanda Ngozi Adichie, Dean Koontz, George R.R. Martin, and J.K. Rowling. The Leisure Reading collection includes most New York Times bestsellers and titles from the Chronicle of Higher Education‘s “What They’re Reading on College Campuses” lists. Books in this collection are rented, and either eventually returned or added to our regular collection. For additional light-hearted reading, check out our magazines such as Runner’s World, Fortune, The New Yorker, the Smithsonian, and Sports Illustrated in the Current Periodicals area on the main level; picture books and children’s fiction (yes, even Harry Potter!!) in the Curriculum Library on the lower level; biographies and fiction in the regular library stacks; and DVDs and videos on the main level. New Books are shelved adjacent to the Research Help Desk. These titles have been recently purchased for the library’s permanent academic collection. New publications by Luther College faculty and staff are often displayed in this area.